A wonderfully atmospheric pair of 17th century carved oak columns; the composite capital raised on a fluted and spiral turned column which terminates in a modern pedestal base. 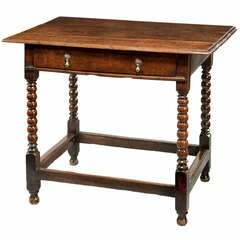 A 17th Century oak table. A late 17th Century oak one drawer side table; the plank top above a frieze drawer and raised on ball turned legs united by stretchers. 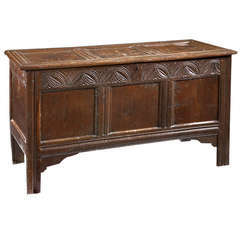 A 17th Century Jacobean oak coffer; having a 3 panelled lid above a panelled front with a frieze carved with arcading; raised on stile feet. 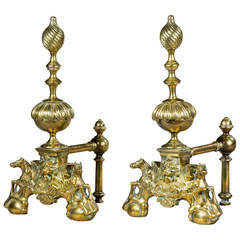 Made of teak with intricate carved decoration retaining the original blue and green painted finish. Made in Java, circa 1900.